When was riddle school made? How many riddle school games are there? How to fix the cookie machine? Riddle School is an interesting point-and-click and puzzle game that was created by Jonochrome (formerly known as JonBro). This is the first game of a series game that have the same name and it was created and released on May 25th, 2006, when its author was just eleven years old. All this series game is a fun story revolving around a lovely protagonist named Phil Eggtree who always feel so boring when being at school and try to escape there. According to Phil, his school is a terrible school where has lockers for dozens of students but the fact that it only has seven ones. The game starts when Phil is sent to a special classroom called as “Special Class for the Insane” because he teases another student of Riddle School. In this special class, he is taught by a not very intelligent teacher - Mr. Kahm who always teaches the incorrect facts about mathematics. And this makes him feel so bored and wants to escape school. Of course, the main mission of players is to help him do that. With an interesting storyline, this game attracts attention of a huge number of players from all around the world. In order to learn more detail about this game, let's move to the next sections. As mentioned above, your main mission in this game is to help our protagonist - Phil Eggtree achieve his goal. In detail, there are various obstacles in this game and you have to use your clever thinking to help Phil overcome all of them. For example, you will have to interact with lots of objects surround Phil and find out the right direction or collect useful items that can help him escape into his inventory. Besides that, you also have to help him deceive and confuse his teacher because there isn't any teacher allowing their student to leave the classroom and wander somewhere outside school. In addition to Phil, in this game, there are lots of other characters such as teacher, mail clerks, principal of school - Mr. Cwesschyn, laborers, guard, and another student named Chubb Munch. You will encounter them in this game and be able to have some interesting dialogues with them. In these characters, there are several ones will suggest you some clues to escape, but some of them will prevent you. The tips for you is doing follow the guides and clues that you receive when interacting with them. This is a simple point and click game, so, it is very simple to control. Use your mouse to click and select the items that you think they can help Phil to escape his school successfully. Let's play this game in full-screen mode, surely you will have more interesting experiences than playing without using this mode. Lots of clues lie in the dialogues between in-game characters. So, don't miss any detail in this game. You can customize the sound of the game through the mute button on the game screen. Below we have a detail walkthrough video for you. If you get stuck at anywhere, let's refer to it. Riddle School series in general and Riddle School 1 game in particular are also very interesting games. They are suitable for all age, both people who are graduated and students because of simple gameplay and interesting storyline. For this reason, lots of people want to play these games at school or their workplace. However, most of these areas block the gaming site. That makes people can't access and enjoy their favorite games including Riddle School series. If you also encounter this issue, don't worry because we have a great solution for you. On this site, we provide you full list of Riddle games for free; and the special thing is that all of them are unblocked versions. This means you can visit our site and enjoy not only Riddle School 1 unblocked game, but also all other games in this series anywhere and anytime you want without paying any charge. It's so great, right? Now, let's start this game and enjoy your relaxing moments. Firstly, click on the sharpener. After that, turn right once and click on the locker that lies next to the fountain. Then go through the hall and come to Ms. Cophey's class. Here, let's click the dustbin. Go out and turn right into the closet of Janitor. There is a feather duster here and let's use it. Continue going out and turn right twice and use the hall pass. Go right twice and use the dollar. Go in the teacher lounge and click on I need to meet the principle" and "I want to tell him a joke". The teacher will go out and a cutscene is over. After that, go left until you leave the school. In case you need a walkthrough video, below here we have one for you. If you get stuck at any levels, let’s scroll down and refer to this video. 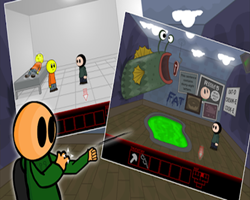 This game was made on May 25th, 2006 by Jonochrome. He created this game when he was eleven years old. Riddle School is a series game and there are a total of 5 games in this series. They are Riddle School 1, Riddle School 2, Riddle School 3, Riddle School 4 and Riddle School 5. In addition to these five games, there are two expansion games of this series. They are Riddle Transfer, and Riddle Transfer 2 and offer the same gameplay as their previous games. Cookie machine is an item that you will see in Riddle School 2 when you are in the teacher lounge. Your necessary task here is to click at the back of the cookie machine to fix it. Yes, it is. On Riddleschoolgames.com, we provide you with all games in Riddle School series for free and you can access the games anywhere and anytime you want. You can play this game right on this site. As mentioned above, here we offer you all games in this series for free. Moreover, all of them are unblocked versions, so, you can access this game even when you are at school or workplace.